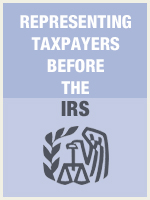 This is a basic level course that describes the contexts in which the Internal Revenue Service ("IRS") interacts with taxpayers in circumstances where representation of the taxpayer would be appropriate. The specific objectives of this course are to arm you with the necessary knowledge and skills to effectively represent taxpayers before the IRS with respect to both audits and collection activity. Using examples and illustrations, this course will familiarize you with the forums in which the IRS is encountered, the methods and procedures of each, and suitable responses to IRS communications. You will learn to distinguish "real" deadlines imposed by law from suggested response dates. Upon completion of this course you will have a better understanding of the options available to assist your clients at various stages of the controversy process, what to expect from IRS personnel, and what is expected of you as a taxpayer representative.